COURSES I am fortunate to teach a variety of courses on a regular basis. Find course descriptions by number in the BSU Catalog. Some titles are linked to web pages with information either about the course or about related resources. Details of scheduling appear on Infobear ahead of each semester or session. Some of these are honors-only. Honors students can arrange for honors contracts in any of my courses. BSU students know how to find details; those who are not at BSU are welcome in all of these courses, except GEOG 298 (sorry! ), with the help of the most excellent staff of the College of Continuing Studies. 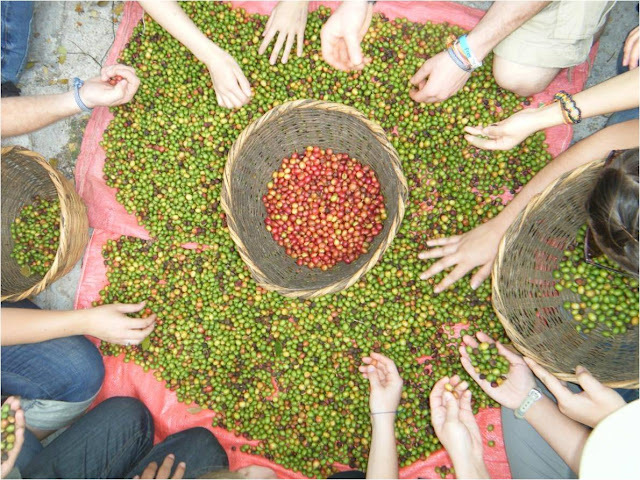 Many hands to separate the coffee during the final round of the harvest. I am a professor of (and evangelist for) geography at Bridgewater State University, south of Boston. My main teaching areas are environmental geography, the geographies of Latin America and Africa, and the geography of coffee.